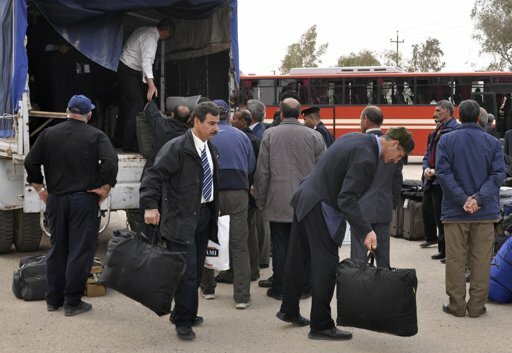 Iraqi sources say 680 members of the terrorist Mujahedin-e Khalq Organization (MKO) have been moved from their original residence in the eastern province of Diyala to a new camp near the Iraqi capital of Baghdad. Diyala provincial officials said the seventh group of the MKO terrorists was transferred from Camp New Iraq, formerly known as Camp Ashraf and situated about 120 kilometers (74 miles) west of the border with Iran, to Camp Liberty on Saturday. 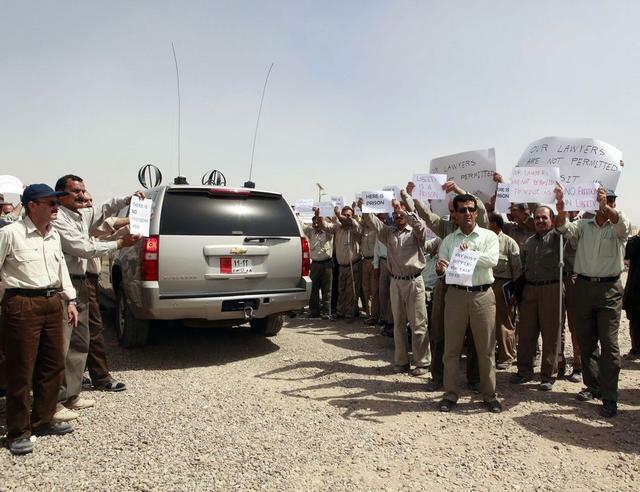 The sixth convoy of about 400 residents of Camp Ashraf was moved to Camp Liberty on August 29. أعلنت قيادة شرطة ديالى عن نقل الوجبة السابعة والأخيرة من سكان معسكر أشرف الذي يقيم فيه عناصر منظمة خلق الإيرانية مساء اليوم السبت، الى معسكر ليبرتي المؤقت في بغداد تمهيدا لتوطينهم في بلد ثالث. وقال المتحدث الإعلامي باسم شرطة ديالى المقدم غالب عطية لموقع "أشرف نيوز" أن" السلطات الأمنية واللجان المعنية بغلق ملف سكان اشرف وإخلاء سكانه إلى بغداد وفق مذكرة التفاهم المبرمة بين العراق والأمم المتحدة أكملت جميع الإجراءات وهيأت الحافلات والشاحنات لنقل الوجبة الأخيرة من سكان المعسكر ". وأضاف ان" الوجبة الأخيرة تضم 680 شخصاً مع الإبقاء على 200 شخص من سكان المعسكر لإستكمال إجراءات بيع ممتلكات المعسكر لحساب منظمة خلق وفقا للإتفاق المبرم مع الحكومة الإتحادية والأمم المتحدة (اليونامي) ". وبين المتحدث باسم قيادة شرطة ديالى ان" عمليات التفتيش وشحن بضائع وممتلكات سكان اشرف المزمع نقلهم تجري حاليا تمهيد لاخلاء الوجبة الاخيرة من سكان اشرف مساء اليوم". ونقلت الحكومة العراقية منذ شباط فبراير الماضي نحو 2400 شخص من سكان معسكر اشرف في محافظة ديالى إلى معسكر ليبرتي في بغداد ضمن الاتفاقية المبرمة بين العراق والأمم المتحدة تمهيدا لتوطينهم في بلد ثالث ويتواجد حاليا في المعسكر نحو 1000 عنصر. BAGHDAD — Iraq offered foreign diplomats a rare glimpse Tuesday of a camp that is the new temporary home of an Iranian exile opposition group that has had a long-running feud with Baghdad, winning from the envoys cautious praise of the conditions there. The Mujahedeen-e-Khalq (MeK) opposed the move to Camp Liberty, a former U.S. base on the outskirts of Baghdad, from another camp in Iraq. They say it is an intolerable prison. Iraq says it is up to international standards. The back-and-forth bickering feeds into a wider, decade-long dispute between the MeK and Iraq over the fate of the former guerrilla movement. Iraq considers members of the MeK to be terrorists and wants them to leave the country. 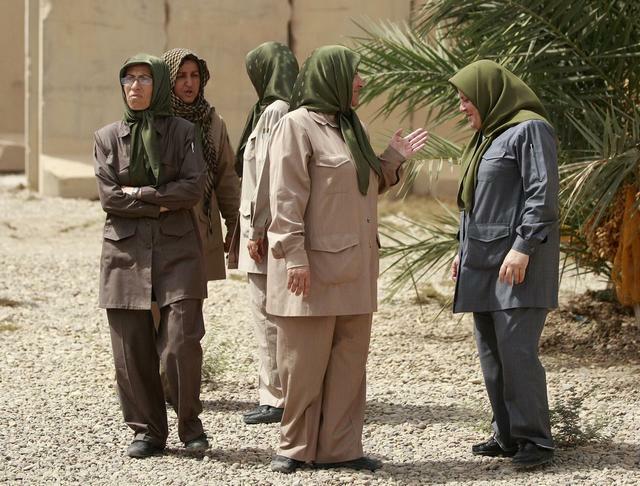 The MeK, also called the People’s Mujahedeen of Iran, wants to move back to its old home at Camp Ashraf, northeast of the capital. Foreign diplomats who visited the dusty complex of former U.S. housing containers described the conditions as acceptable. Some said the conditions there looked good compared to those in other refugee camps. “I wouldn’t choose to live here, but when we talk about refugees and what their living conditions are all over the world, this should be considered exceptional,” said Ramon Molina, the Spanish Embassy’s deputy chief of mission. 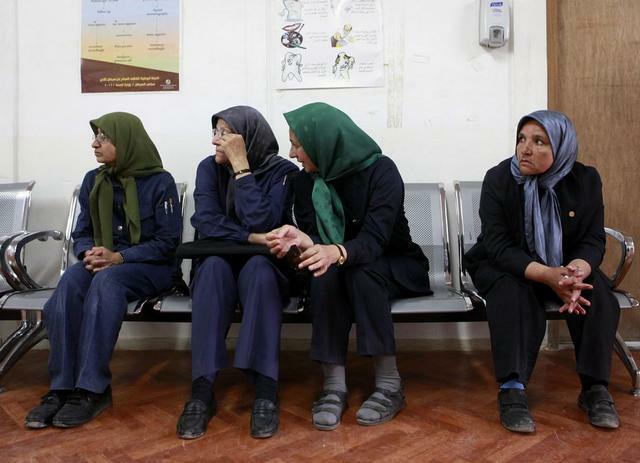 The MeK dissidents complain that they are not allowed to leave and they live without reliable electricity, air conditioning or water supplies. 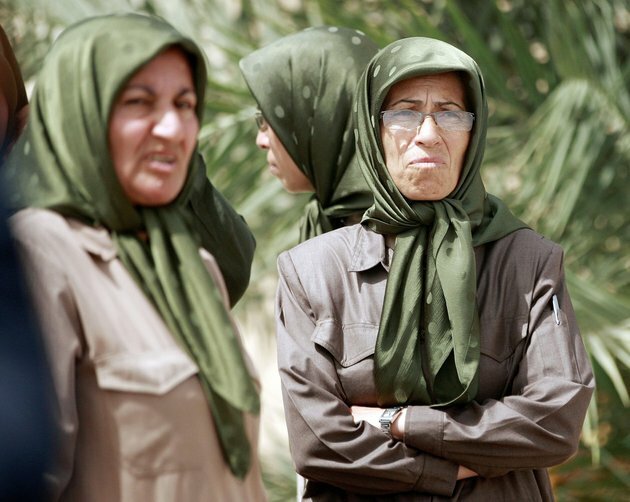 The MeK opposes Tehran’s clerical regime, and several thousand of its members were given sanctuary in Iraq by dictator Saddam Hussein. But the Shiite-led government in Baghdad, which is bolstering its ties with Iran, says MeK members are living in Iraq illegally. The group also is designated as a terrorist group by the U.S., but Washington is weighing whether to take it off the list — a decision that is expected to be made in upcoming weeks. 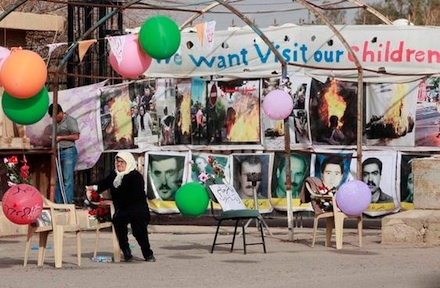 Camp Liberty was designed as a compromise way station for the U.N. to speed the exiles out of Iraq peacefully. Iraqi security forces have launched two deadly raids since 2009 on the MeK’s longtime home at Camp Ashraf, an inclusive minicity the exiles never wanted to leave. At Liberty, the exiles live in cramped portable housing units left behind by the U.S. military, which occupied the base until it withdrew its troops from Iraq in December. The Associated Press and Iraq’s state-run TV also were on the tour, the first time the Iraqi government has allowed journalists inside Liberty since the MeK began moving there earlier this year. 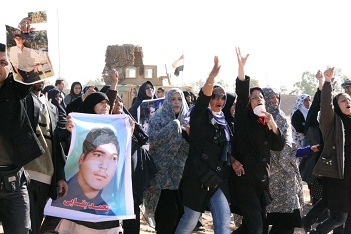 The exiles’ local leader, Abbas Davari, called the camp “dilapidated” and complained that Iraq has delayed the MeK from moving generators to Liberty from Ashraf and has stymied construction of a water-treatment system. 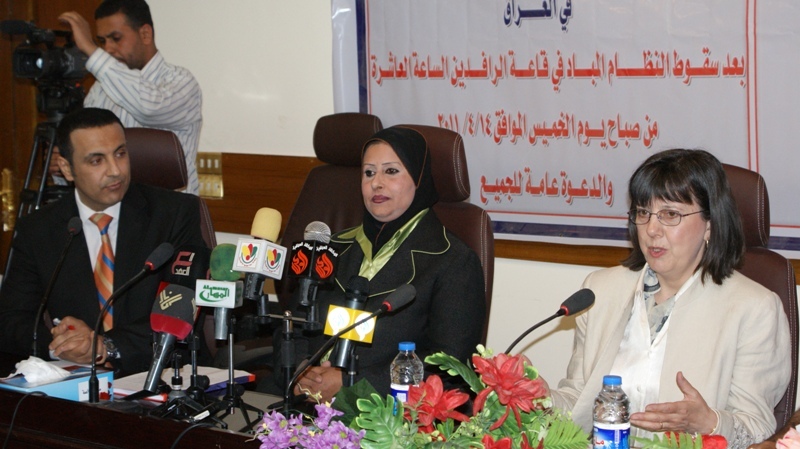 Gorges Bakoos, who is overseeing the issue for the government, said officials are trying to resolve both problems. DIALA / Aswat al-Iraq: Police sources said today that the anti-Iranian Ashraf Camp shall be fully evacuated by the end of this month. The source told Aswat al-Iraq that 2400 members of the camp were moved to Freedom Camp near Baghdad airport in six groups. There are 800 members remaining who will be moved in two batches; the first will comprise of 600 members and the second 200. The Camp shall be fully closed by the end of this month, the sources confirmed. 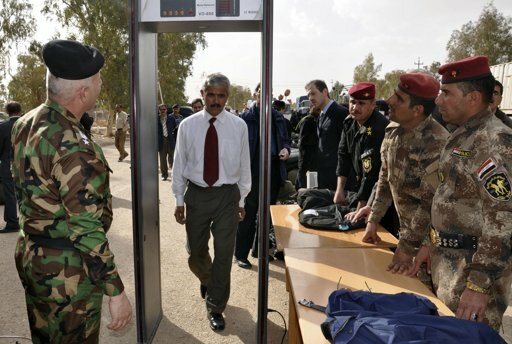 It was intended for the camp to be the headquarters of Dijla Operations Command, which includes Diala and Kirkuk military operations, due to the site's location. 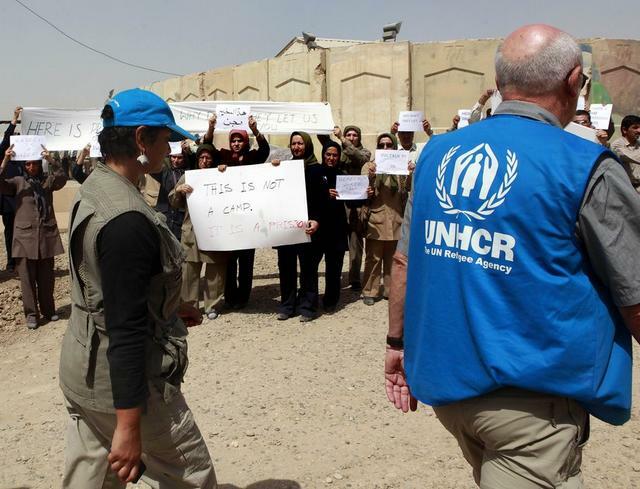 Iraq agreed with the United Nations to evacuate Ashraf Camp, Diala, 57 km northeast of the capital, Baghdad, and move its anti-Iranian members to an alternate camp near Baghdad before moving to another haven. Ashraf Camp is the military camp of anti-Iranian Mujahidi Khalq (The People), which was regarded by the United States, Iraq and Iran as a terrorist organization, unlike the European Union which lifted it is name from terrorist organizations in 2009. The members of the organization lack any legal position in Iraq, but the Iraqi government pledged to close it by the end of 2011. Author of the books "The Life of Camp Ashraf (Mojahedin-e Khalq – Victims of Many Masters)" and "Saddam's Private Army". Another date has come and gone after Massoud Rajavi - through his wife Maryam - agreed that the next group of MEK members would transfer to Camp Liberty on 23 August. Of course, welcome as such statements of intent are, there are many considerations which need to be taken into account before such a move can be undertaken. Not least of which is that there exists an accountable, humanitarian process for transferring these people which needs to be in place before they can be moved. This process is reliant on the scrupulously proper procedures detailed by the UN working in conjunction with the Iraqi authorities. Certainly there will be nothing to prevent the movement once these procedures are in place. It will only depend then on the MEK leaders being true to their word and allowing the individuals to be moved. The arrest of MEK spokesman Mohammad Eqbal for deliberately obstructing this process must send a clear message to the MEK leader Massoud Rajavi that he must comply the with legal requirement to allow these people to leave Camp Ashraf. Alas, so far the MEK continues to mire the process with unwarranted prevarication as the MEK leader persists in making his unreasonable demands; demands designed to cause confusion and frustration and to attempt to provoke disagreements and recriminations between the Iraqis, the UN and international observers. The MEK leader says two things must happen before anyone else moves. His first demand is a delaying tactic. Rajavi says that conditions in Camp Liberty must be improved - in spite of it being judged to meet internationally agreed standards. A Washington Times report quoting Mr Tahar Boumedra, the former human rights chief at the U.N. mission in Baghdad who resigned his post in May accused Martin Kobler the UN Special Representative for Iraq of deliberately covering up 'prison like conditions' at the camp. “These efforts are one of the main reasons why this very tense situation has not already spilled over into further violence,” he added. Tahar Boumedra was a well known character in Iraq during his tenure there. He enjoyed friendly relations with the MEK and was one of very few outsiders who were allowed inside Camp Ashraf. After leaving his post in Iraq, flights and accommodation have reportedly been paid by MEK supporter, R.Bruce McColm, President of Global Initiative for Democracy, as part of a campaign to advocate for the MEK. The second of Rajavi's demands is that the MEK must come off the US terrorism list. There are a host of reasons behind this demand. The most important of which is that Rajavi believes this to be key to the continued longevity of his group. Rajavi's worst fear is the inevitable dissolution of his cult. This long term problem is still ongoing partly in the form of natural attrition of forces. 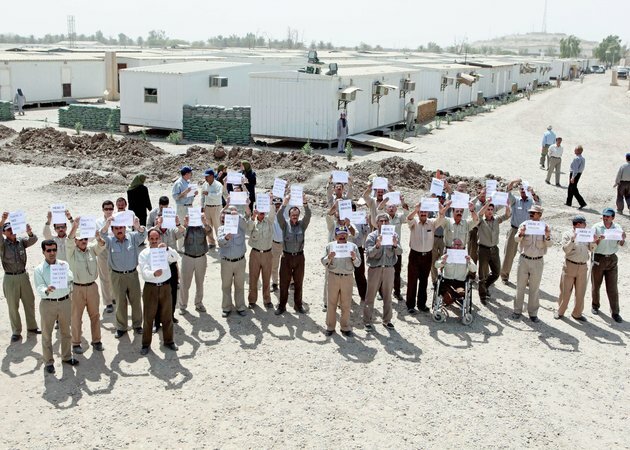 As residents of Camp Ashraf have been moved to Camp Liberty, they are offered a glimpse of the normality of the outside world. Several have taken advantage of this and voluntarily walked away from the group to take refuge with the Iraqi authorities. A major problem for Rajavi is that during the UNHCR refugee determination interviews in which the residents of the camps are being assessed for refugee status, it is made clear that in order to qualify for refugee status the individual must renounce membership of the MEK. Rajavi is being advised wrongly if he believes that delisting the MEK as a terrorist entity will allow individuals to maintain membership of a political group and qualify for refugee status. He needs to ask for clarification of the legal requirements for assigning refugee status. Certainly delisting in the US will not affect the situation of individuals in Iraq. More importantly however Iraq citizens demonstrated recently against the continued presence of the MEK in their country. The Iraqi government has reiterated their demand - the MEK cannot be regarded as anything except a terrorist organisation and they must all leave Iraq. Iraqis claim that the delays and game playing are all aimed at eventually taking the group off the US list and that this will lead to pressure on the Government of Iraq to keep the group there. The Iraqis argue that any such move would be irrelevant and that Iraq will always regard the MEK as terrorists because of its past history and its current behaviour. The MEK's current behaviour is a clear case of interference in the internal affairs of Iraq should not be tolerated by mediators like the UN or US or EU. The Iraqi government spokesman Ali al-Dabbagh said however that delisting the MEK in other countries would allow these countries to receive the former members as refugees.